One, two, three: creating collages in CollageIt is simple and quick. There’s no doubt that a photo collage is a striking way to show off a set of photos, and CollageIt’s sole purpose in life is to make this process as simple as possible while delivering impressive results. It’s a simple process: select your photos, click Page Setup to select the size of your collage, pick some basic layout options and then click Generate Layout. The options on offer include limiting how many photos to include, the space and margin between them, degree of rotation for the photos and what kind of background border to have. Experiment to your heart’s content – the preview should automatically update or you can click Generate Layout again to see the fruits of your labours. When you’re happy with your collage, click Save to output it as an image file – all popular formats are supported. 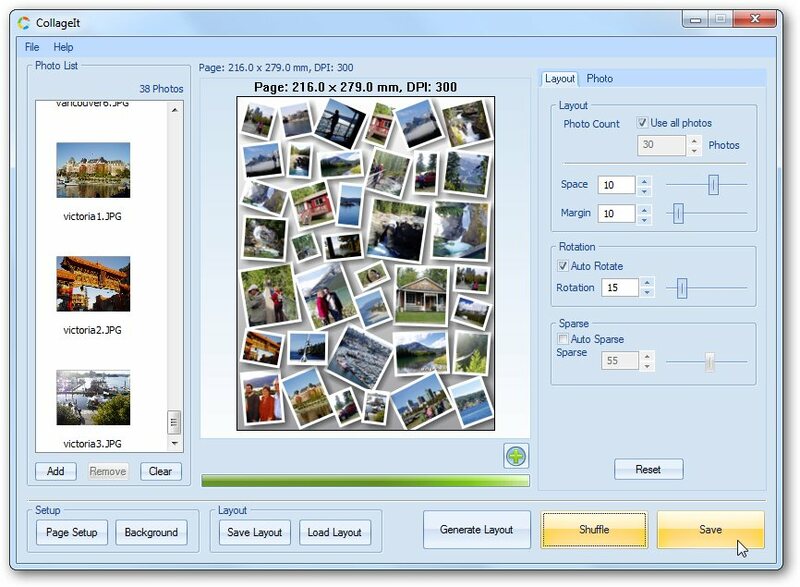 This free version comes with some restrictions: a watermark will be placed on your collage, and – Windows users only – there’s also restrictions on the size of your output file. Mac users don’t have this latter restriction, but the page setup screen is much more basic: you have to manually enter your collage size in pixels, and there are no convenient page sizes such as A4 or Envelope available from a dropdown menu. The Pro version costs $19.90, and a further incentive to upgrade is the added ability to crop individual photos. But if you can live with the watermark and restricted image size then CollageIt should have all the key functionality you need. Simple, straightforward and produces striking collages. However, the absence of a print button detracts from its overall value slightly.